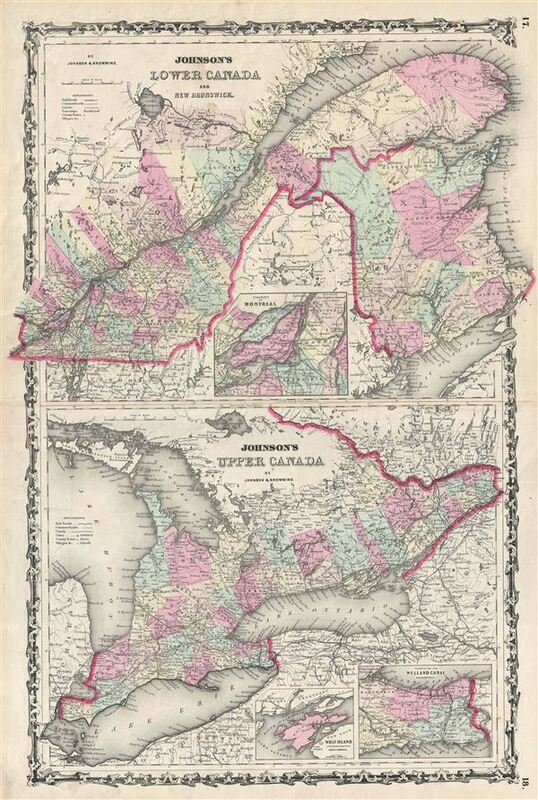 This is A. J. Johnson and R. Browning's 1861 map of Upper Canada (Ontario) and Lower Canada (Quebec). Divided into two maps. The upper map consists of the provinces of Quebec and New Brunswick. Features an inset map of the environs of Montreal. Lower map focuses exclusively on Ontario. Features inset maps of Wolf Island and the Welland Canal. Both maps are color coded by district and detail major roadways, cities, rivers, trains and ferry crossings. Features the strapwork style border common to Johnson's atlas work from 1860 to 1863. Published by A. J. Johnson and Browning as plate numbers 17-18 in the 1861 edition of Johnson's New Illustrated Family Atlas. This is the last edition of the Johnson Atlas to bear the 'Johnson and Browning' imprint. Subsequent editions reflect Ward's 1862 acquisition Ross C. Browning's shares in the firm.